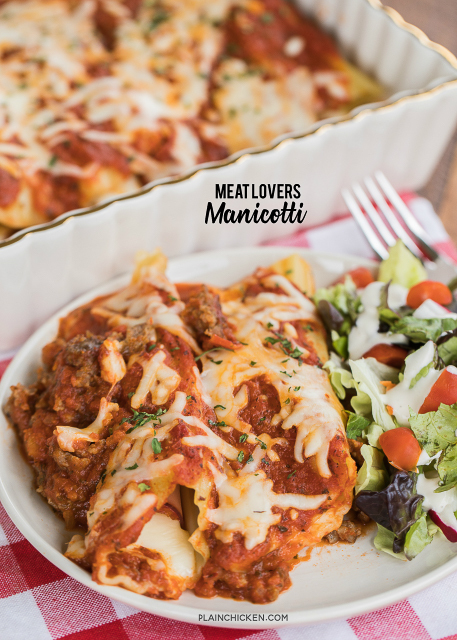 Easy Meat Lovers Manicotti Recipe - manicotti stuffed with cheese, ham and pepperoni and baked in a quick meat sauce. Super easy and DELICIOUS stuffed pasta casserole. 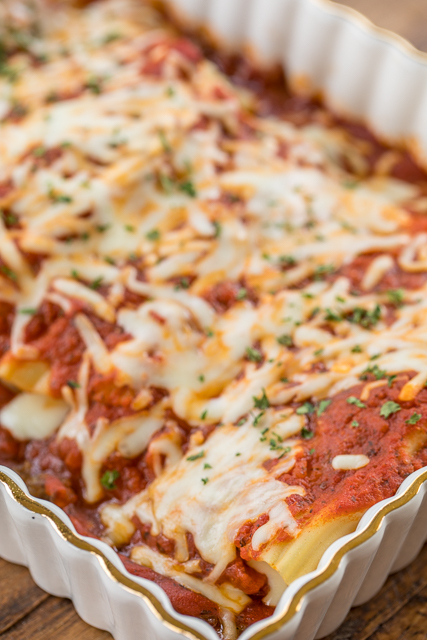 Use string cheese to easily stuff cooked manicotti noodles. Can make ahead and refrigerate or freeze for later. All you need is a salad and some garlic bread for a quick weeknight meal!! 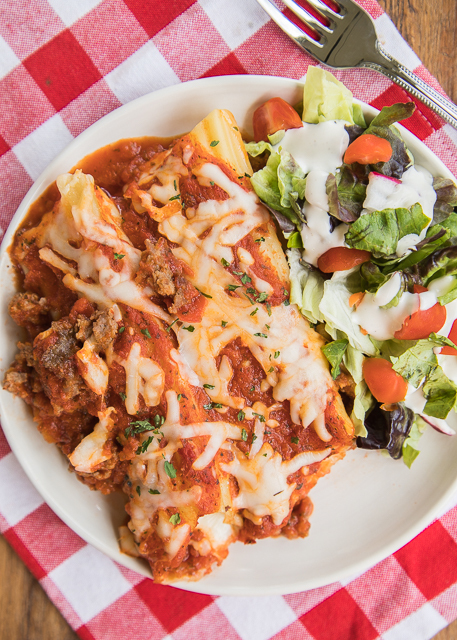 We are in love with this Easy Meat Lovers Manicotti. 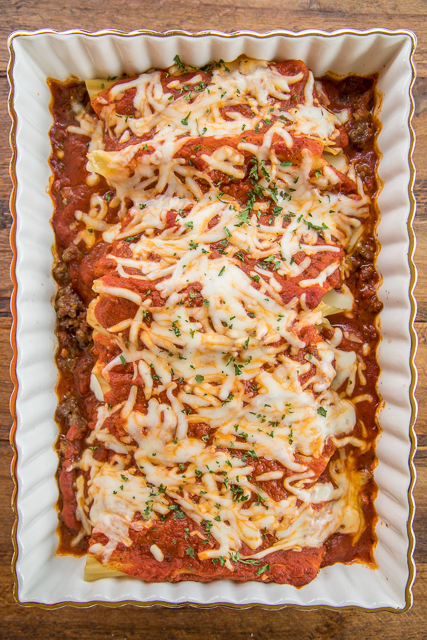 It is manicotti stuffed with ham, pepperoni and cheese and baked in a quick meat sauce. If you are like me, the hardest part of making manicotti is stuffing the cooked noodles. Well, this recipe makes stuffing the the noddles a breeze! I used string cheese! Brilliant! I just rolled up the ham, pepperoni and string cheese and slid it right inside the cooked manicotti noodle. Super simple! For the meat sauce, I used Italian Sausage. You can swap it out for ground beef if you aren't an Italian Sausage fan. Either way, this will taste delicious! I used my favorite jarred sauce, Trader Joe's Roasted Garlic Marinara, for the spaghetti sauce. I also love La Familia Delgrosso jarred sauce. Both sauces don't have chunks of tomatoes in them - that is very important to me!! 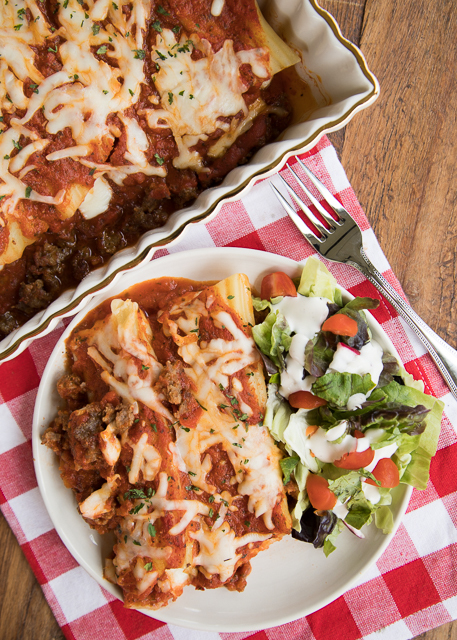 We absolutely loved this Easy Meat Lovers Manicotti. You can make this ahead of time and refrigerate or freeze for later. We ate this for dinner and leftover for lunch the next day. I was just as good reheated. All you need is a salad and some garlic bread and you are set! Remove sausage from casings. In a skillet over medium-high heat, cook sausage until crumbled and no longer pink. Drain fat. Stir in spaghetti sauce. Pour 1/2 cup of meat sauce into prepared pan. Set remaining sauce aside. Cook manicotti noodles according to package directions. Drain and cool until able to handle. Lay ham slice flat. Top with 4 slices of pepperoni and one stick of string cheese. 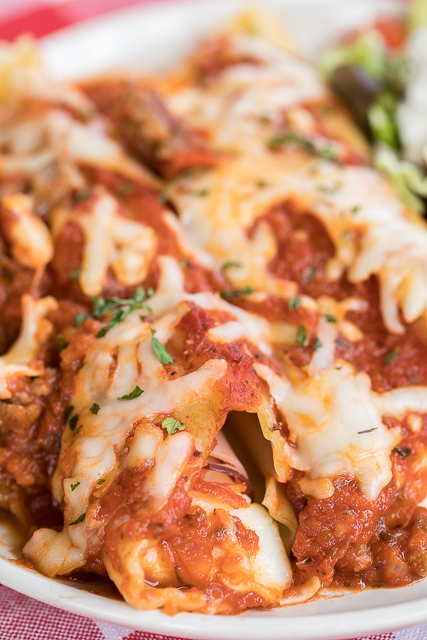 Roll up and stuff into cooked manicotti noodle. Place manicotti onto of sauce in prepared pan. Repeat with remaining ingredients. Pour remaining meat sauce over manicotti. Top with shredded mozzarella cheese. Bake uncovered for 30 minutes, or until bubbly. Sounds great Steph - I need to make some manicotti and use your crepes for the pasta - wow 7 years since I first made them. That sounds AMAZING!! I will have to make this with the crepes next time!! Holy cow this sounds good! I will have to try this! It is so good! Enjoy! !